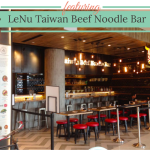 GRUB NOODLE BAR – for those late night beef noodle cravings! 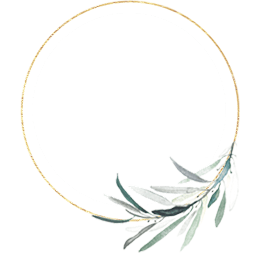 | Beverly's Net: family. food. fashion. 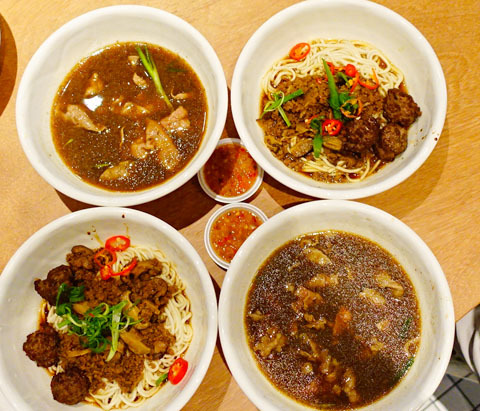 GRUB NOODLE BAR – for those late night beef noodle cravings! – Beverly's Net: family. food. fashion. So the Cookyn Inc team continue on their takeover of Singapore on all foodie fronts with another one of those man, why hasn’t anyone thought of doing this sooner? projects. Not content with the super-popular GRUB @ Bishan Park, and the still relatively new alfresco poolside Fix Cafe, they’ve decided to launch with a completely different concept whilst retaining their original premise – that of always using quality ingredients and serving wholesome food. And so we have………. GRUB Noodle Bar! 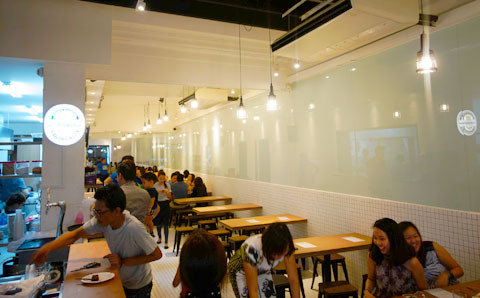 GRUB Noodle Bar is targeted to the dinner and late-night crowd, the supper-hungry folk that want a hearty and wholesome meal. 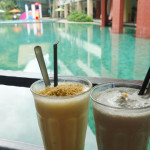 Open only in the evenings, it is a delightfully relaxed and casual cafe with an upbeat vibe. Look at these lil cutie pies! 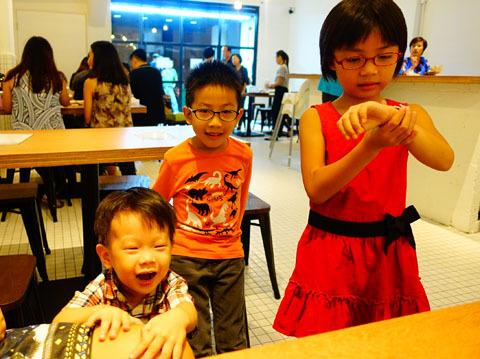 Food here at GRUB Noodle Bar is perfectly safe and good for young children. It contains no MSG and no weird bits. 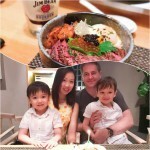 The noodle broth is cooked in-house and is wholesome enough for kids to slurp up every last drop. The menu is straightforward. But let’s start with the appetizers. There are 7 available, and you’ll have a pretty tough time trying to pick just one! I highly recommend ordering as many appetizers as you can, because they are awesome. 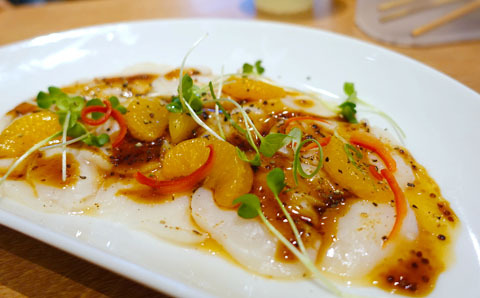 Hokkaido Scallop Tataki – lightly torched scallops with mustard glaze and mandarin ($15). This is the dish to order if you’re an Instagrammer 😉 It photographs well and the colours are gorgeous! I’m a big fan of tataki, and this didn’t disappoint. The scallops were fresh and plump, and I was surprised that the sweet mandarins paired very well with it. 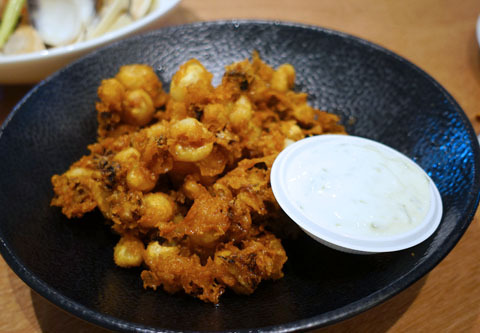 It’s a very light and refreshing appetizer, and is a lot cheaper than what you’d pay at fine dining restaurants for the same thing. 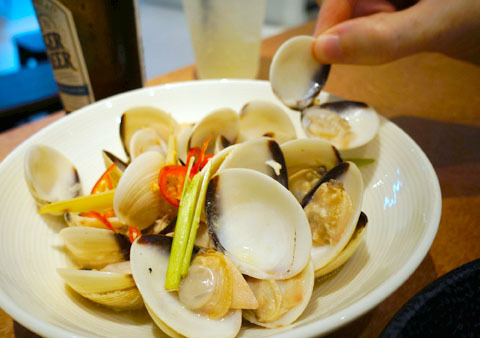 Venus Clams – sauteed in beer, toasted ginger and lemongrass broth ($13). 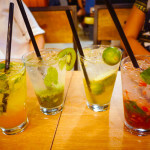 I’d order this again in an instant. Fun to share with friends, because it’s casual, finger-food dining at its best. The clams are juicy with the faintest flavour of the ocean, set against the light-yet-flavourful broth. The dish’s cool factor is upped by the fact that it’s a beer broth, but it’s actually not very noticeable. Time for our mains…. 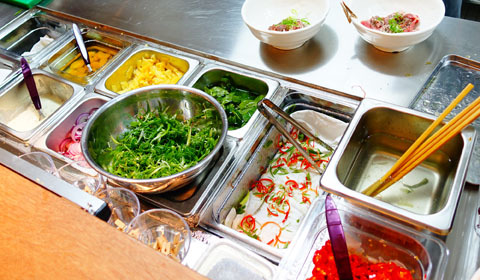 This is the counter top where the staff work at top speed. Isn’t it colourful?! 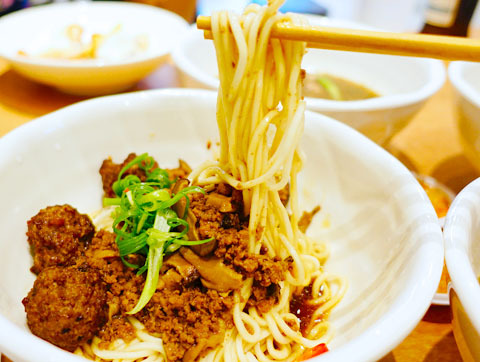 They whip out a bowl of noodles every few seconds, and off it goes to your table – piping hot. So THIS is what they’re gonna be famous for. 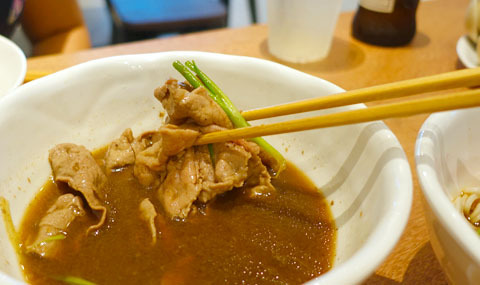 I’ll guarantee you, straight up and no beating around the bush here, you will find no sliced beef more tender than at GRUB Noodle Bar. They must sing to their beef and make sweet love to it at night or something, because the beef comes out totally unreal! Bowl Part 1 has fresh egg noodles in house sauce, 100% beef meatballs, mince beef, mushroom stew. I personally reckon this is a full meal in itself, because the portion size is so substantial and there’s already so much meat in it! The slices of raw beef (of your choice) is dunked in the piping hot broth, and served straight to you. And OHMYGOODNESSWHATTHEHELL the beef is tender!!! I had both the Rump and the Angus Ribeye, and both were melt-in-your-mouth silky tender. It was actually kind of bizzare. Sliced beef almost always has a few sinews or tendons in it, but our slices were all completely devoid of that. If you’re on a budget, the Rump option is more than good enough, and you’ll see that it is so incredibly tender. If you feel like splurging and really want to feel luxury on your tongue, the Ribeye option is $4 more. 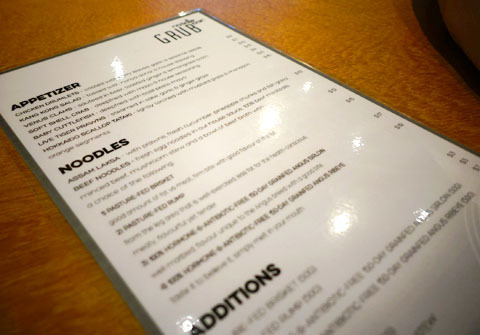 The downside I see about GRUB Noodle Bar is that it’s only open after 7PM… when both my kids have already gone to bed. That means they’ll never get to eat it – wah! I’d love them to, because normally beef is too tough for them to handle, but I bet this one will be just fine with my kids. Tip: If there are two of you, I’d recommend ordering 3 appetizers and 1 bowl of beef noodles to share. It’ll be way too much food if you order 1 bowl each, plus appetizers! 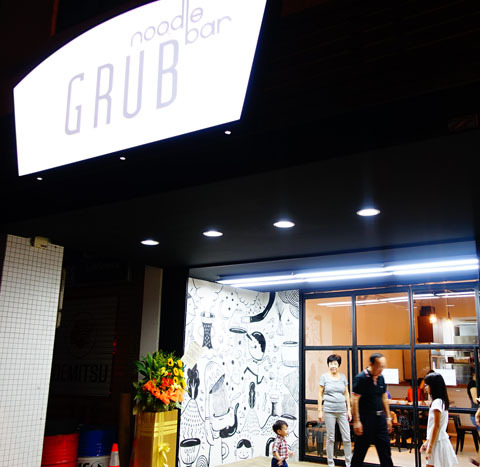 GRUB Noodle Bar is located at 221 Rangoon Road. Previous SWENSEN’S LAUNCHES LOBSTER ROLLS!